Anyway, it sounded more like jazz than Vivaldi. I was shocked, but it was superb music. I decided they’d got it wrong and they were just trying to make a name for themselves by doing something that was quite wacky. Then a few years ago on the trusted old BBC radio four, I think it was the slot between 8 o’clock and 9 o’clock in the morning, there’s a piece about some Mozart that had been found somewhere or other. It was supposedly something written in Mozart’s own handwriting for teaching one of his pupils and ornamented one as piano works to suggest what the pupil should be playing in between the dots were written. This sounded in style remarkably similar to the Vivaldi, in that it was as much like jazz is like Mozart. Pianists only have the basic dots these days and don’t all lament the music in anything like the way that this piece was ornamented. This has to be remembered when playing at a wedding reception. One doesn't want to be too formal in the way of playing baroque and classical music. You are at a celebration of a couple's marriage and the music should be commensurate with that, and I am sure Mozart and Vivaldi would approve of 'jazzing it up a bit'! 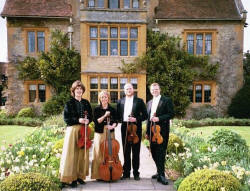 But nevertheless, for a string quartet there is a right sort of style for each composer. Beethoven needs other performance techniques and playing style to that of Haydn quartet. When you get to Debussy and Ravel string quartets, no two bars are the same speed and the whole work is pulled around in tempo and dynamics to such an extreme extent that only the most integrated string quartets stand a chance of playing them. Because of this extreme difference one finds that the temperament and inclination of the individuals that make up the string quartet has tremendous influence on what they can be good at playing, and whilst all string quartets can play a wide range of music, they will excel at certain composers and be relatively mundane at others. This is also affected by their education as there are many different schools of string playing. Listening to an Eastern European string quartet (I find Eastern European quartets the most exciting) is very different listening tour string quartet that has come out of one of the London music colleges. There are also nationalistic and racial effects. Everyone can appreciate the lilt of a Viennese waltz excitement and wildness of Hungarian dance, the solidity of Brahms and Beethoven Symphony, and sometimes, though not always, there developed nationalistic characteristics may limit the performance concept of other styles. This isn’t to say that one of the famous Russian quartets in the days of the Cold War, who had never been let out of Russia, could not perform a quartet by Beethoven or Debussy, or that a hot-blooded Italian string quartet could not play one of the Shostakovich string quartets that can bring the temperature of the concert hall down to that of the Siberian winter. But obviously the nationality and training of the string quartet players. So, tradition plays a part in a string quartet performance and there is a concept of “right style” which is a form of conservatism and a limitation, but this does not limit the most talented of modern composers and string quartets who will go beyond the prop, classical, and romantic patterns and familiar harmonies to completely new effects, harmonies and structures. These new works are indigestible to most people, including many string quartet players. One great difficulty for string quartet tackling a completely new work of this ilk, is that they have little idea what it should sound like. When one plays a Haydn string Quartet, particularly in the fast passages, one isn’t really looking at all the notes. You know the style so well that you can fill them in by year. You’re only taking note of the surprise deviations from the style. With a modernistic string quartet you don’t have this guidance and to boot many modern string quartet composers are very cool in the demands they make of the technical skill of the musicians. It’s almost as if they have in their head the idea that the more technically ridiculous it is the better the piece of music. It sometimes refreshing to listen or play music by composers like Karl Jenkins and some of the film music composers, where listen ability is an important factor and fantastic gymnastics isn’t necessary in every bar to justify themselves. It’s amazing to think of the difference between some early string quartet performances and the performance that one would get today in a concert. To think that the product first performance of Schubert’s D minor string quartet (death and the maiden), which was performed in the composer’s presence, had cuts made in it by the performing quartet! What an insult to such a great man. Even after Schubert’s death, when his works had become popular, were the most distinguished European quartets not only made cuts in the music but performed lighter pieces between the movements. Can you imagine that happening today? There would be an outcry! Planning a concert programme requires self-control from the musicians. Most musicians want to carry on playing all evening, whereas audiences soon get fidgety if they’re expected to concentrate for too long. And this need for speed, forgetting all the other things, is manifest in performances. You only have to listen to the performance speeds of music in classic FM. Sometimes I think there playing the recording at the wrong speed, they choose such hyperactive performances. (Of course, in the days when music was recorded on vinyl, record decks had speeds of 33 1/3, 45 and 78 reps per minute. Classical music was recorded on LPs at 33 1/3 revs per minute, but I can recall a number of occasions when broadcasters got it wrong, mostly on the upcoming local radio stations but also on the BBC. Many’s the time that I’ve picked up the telephone to say “please change the record decks paid”. With digital recording, this risk has been removed. So there is no excuse for hearing a quartet rush into a late Beethoven string quartet as though it were a race to the finish line, with frantic tempos and all the mellowness and meatiness missing. Or there’s the finale of the Haydn D major which is marked Vivace, meaning lively, animated, brisk but not tremendously fast. So often ones here is this being raced through as if last musician to the end this a sissy.